Finn Geotherm has completed a landmark installation for leading European agricultural plant breeder RAGT Seeds in Cambridgeshire, to deliver both heating and passive cooling with significant energy savings. 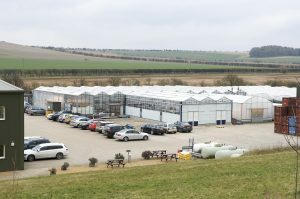 RAGT’s initial brief was to reduce the heating costs for its six glasshouses, which are used for developing new crops. LPG had previously been used to heat the glasshouses which, with a U value of around six, meant the boiler was in constant use in winter, leading to issues with fuel supply and heat distribution as the system couldn’t keep up with the heat being generated. RAGT needed a new system to work with its existing grow tubes. Finn Geotherm installed three Lämpöässä T120 ground source heat pumps linked to three Akvanti 2400litre thermal stores with a network of 21,000metres of collector loop. Controlled using Trend building management, the 350kW ground source heat pump totally replaces RAGT’s previous LPG system. While specifying ground source for RAGT’s heat requirements, Finn Geotherm identified an opportunity to utilise the new system to deliver air circulation and cooling. This would ensure a constant temperature all year round for crops to thrive in. Glasshouses had been known to reach 45°C (compared to the target temperature of 21-22°C) and low level techniques, such as painting windows and using fans, were ineffective. However, the implementation of a cooling system had to be very carefully developed to ensure the system did not impact negatively on the Renewable Heat Incentive (RHI) available to RAGT Seeds for the ground source heat pump installation. Finn Geotherm’s team of experts devised a bespoke passive cooling system to circulate air at ambient ground temperature from the ground loop. Cool air is circulated through 24 Jaga AVS fan coil units (four per glasshouse) using a control system which activates if the temperature increases by 1°C from target. Passive cooling delivers the reduced temperatures needed by RAGT in summer using minimal energy. Air circulation from the cooling system has made a significant impact too, providing a ‘gentle summer breeze’ in the glasshouses. Along with the better regulated temperature, RAGT is also now enjoying enhanced plant growth and expects to reduce chemical inputs. AWARD-WINNER! 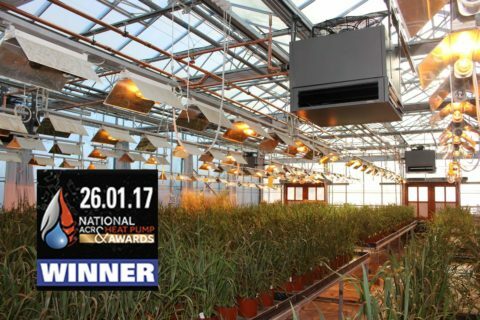 This project was awarded the prestigious title of Non-Domestic Ground Source Project of the Year in the National ACR & Heat Pump Awards 2017. 12 Apr 2019: BusinessGreen Leaders Awards 2019 finalist! Would you like to tell us a little bit more? The following fields are all optional. Thank you for requesting a call back.